The trend scenario is based on the assumption that the current energy saving trends will continue beyond the period under consideration. From today’s point of view, only a very moderate energy price development (+3 % per year nominal) is proceeded during the period of consideration, i.e. the next 10 to 15 years. What cannot be taken into account are conceivable regulations accentuating the existing requirements concerning heat system efficiency or heat insulation, significant substitution effects as a result of the disproportionately growing importance of natural gas, district heating and electricity in the heating sector as well as a considerable jump in prices in the energy price sector (e.g. due to a new oil crisis or significant amounts from taxes on carbon dioxide emissions or energy consumption). The consumption of heating energy will decrease steadily thanks to the renewal of older heating systems and to heat insulation measures carried out as part of the required sanitation programme for buildings. Expected new construction activities in the fields of flats and houses as well as trade will, however, make up for these savings. A positive result is the fact that the maximum heating energy consumption has most obviously been exceeded. The basic conditions for the trend scenario are the stagnation of the driving performance from 1995 on for the total road network besides motorways as well as a decreasing specific energy consumption of cars and vehicles. One of the results of the trend scenario is the reduction of carbon dioxide emission in road traffic by 10.8 % until 2005, compared with 1990. By 2010, emissions will even be reduced by 13.7 %. This shows that we experience a clear development towards a significant emissions reduction, even without specific emissions reducing measures or action programmes. The reason for this development is the continuous conversion of all cars into low-emission vehicles. However, the development of Stuttgart’s energy consumption shows that, referring to the whole energy market, the expected energy savings in the heating and traffic sector are opposed to an increasing use of energy in the fields of process heat and power / light. Despite the increasing use of energy saving electric appliances, the electric power consumption of households is expected to rise continuously, but with an average growth rate of only 0.4 % per year. The energy use of process heat and power / light in industry is also expected to rise due to cyclical developments. 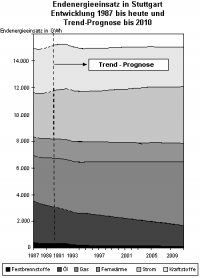 This means that carbon dioxide emissions from the whole energy market in Stuttgart expected for the next 10 to 15 years will hardly drop (10 % until 2005, 11 % until 2010, compared with 1990), unless decisive measures are taken both in the room heating and traffic sector and in the fields of power / light, industry and trade. A significant emissions reduction can be reached for traditional pollutants (nitrogen oxides NOx, carbon monoxide CO, volatile organic compounds VOC, sulphur dioxide SO2) thanks to the foreseeable improvements in the field of combustion engineering, the successive renewal and modernization of heating systems and the reduction of the sulphur content in fuel. Under these conditions, the target values concerning a maximum reduction of carbon dioxide emissions cannot be reached with the household and small-scale consumer sector contributing disproportionately.